There are times when I think the fans are the ones who need to be drug tested. This is one of those times. Over this past weekend I have heard fans suggesting that the Miami Dolphins start Matt Moore over Ryan Tannehill. This was after Moore gifted the Dallas Cowboys with a pick-six during their preseason game Saturday night, against the backups no less. I can understand getting excited by Moore moving the offense down the field, he is an excellent backup quarterback. I even understand the frustration of Tannehill having difficulty connecting on the long ball with Mike Wallace(perhaps the receiver should receive some of the blame). But start Moore over Tannehill? I do not see it. Do these fans remember the last time Matt Moore played during the regular season? I will remind you. Moore took over for an injured Tannehill during the 2nd half of the Buffalo Bills game. He manage to complete 2 out of 6 passes, worse still he completed the same number of passes to the Bills. Two completions and two interceptions. It was a bad day for Moore. Not that he cannot do better, he has, but with that memory is that who you want replacing a very promising young quarterback? Fans love the backup quarterback. Last season I had a friend of mine suggest that Matthew Stafford of the Detroit Lions should be benched for his backup Shaun Hill. Matt Stafford who has thrown for over 17,000 yards and over a hundred touchdowns should be benched for Shaun Hill. It seems ridiculous. But it is understandable. Every fan wants that elite quarterback, they want Tom Brady or Aaron Rodgers. The problem is there are only so many of those going around. It is not that Matt Moore or Shaun Hill are not starting quality quarterbacks, they would easily start for the Houston Texans or Oakland Raiders this season. 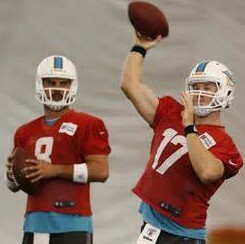 It is that in those situations, behind Ryan Tannehill and Matthew Stafford, they understand their role as the backup. While Moore and Hill have tremendous ability, Tannehill and Stafford have that extra something that puts their ceiling just a little higher. Enjoy your backups, cheer for them when the time does come for them to come into the game. Just try to have some perspective. Understand there is a reason they are the backup and the other guy is the starter. Matt Stafford is great ! But the Lions who went 1 and 6 to close the 2013 season and missed a golden opportunity to win there division would of won one of those last six losses if they inserted a spark-plug in the name of Shaun Hill. Maybe not to start a game but the second half of one of those games. It was almost a half of game that the Lions did not win the division. It is 2014 and Shaun Hill is considered a season veteran and in many peoples eyes is considered old. But Shaun Hill is very tall and can make quick decisions with a rocket arm ! A thank you to Mr. Tennant to produce this article and remind why the 2nd string quarter-back is the most popular guy in town.